Pete, Mas and I had a leisurely breakfast, and hung about chatting until it was time for Pete to leave. We took him off to Mill Hill station, and returned home. 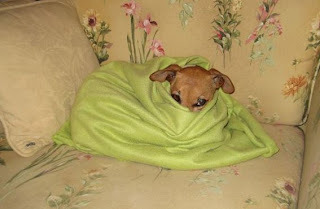 I spoke to Diane who was sounding cheerful, and got a nice email from Joan with a picture of one of the dogs, Maggie, who is feeling the change in the weather. I can understand how Maggie feels as I have got a sore throat and feel like snuggling down too. Today I went to the doctors and saw Dr. Briggs who is a very good doctor and has a great sense of humour. After looking at my throat, which he said was bright red, he asked if I was dribbling. I could not resist saying not more than usual, he then told me I must rest my throat, so I asked if that meant not shouting at my husband, and with a twinkle in his eye he said not for three days. Mas had been waiting for me and we drove off to The Broadwalk and Boots to get my prescription. As we had to wait we had a coffee there too. Once home I spent the rest of the day resting my throat and the rest of me too. 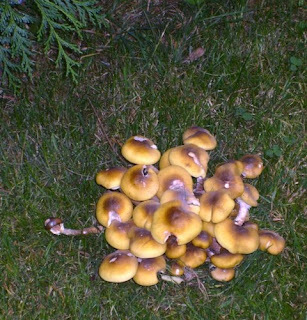 I did notice that the garden is growing clumps of fungi, which must be feeding on dead tree roots from the Ash tree we had to cut down. Mas had to go off to the dentist again today, and came back with a very sensitive tooth. While he was away I cleared up and vacuumed as we were expecting Pete to come and stay overnight with us. we had also invited Poppy and Ben to come over for the evening and have a meal. Jana also flew back to the Czech Republic today. Poppy and Ben arrived first and we sat in the conservatory chatting and having some drinks and nibbles; Poppy had made a lovely starter with aubergine and other ingredients. Ben was joking about some rather explicit books he had been trying to sell at the car boot which made us laugh a lot. Pete arrived looking very formal in a dark suit, and a bit tired. We went into the dining room when Mas called, and he had put out the meal which was chicken based and very nice followed by a blackberry crumble and a lemon meringue which Poppy had bought over, and we proceeded to overcook at the wrong oven temperature! Despite that we all had a cheery time together. It was a nice evening, but we did not stay up too late as we were all rather tired. 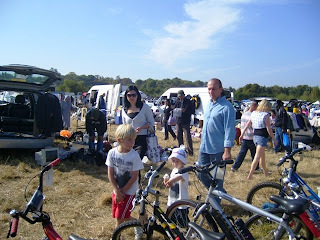 After breakfast today Mas and I drove off to a local car boot sale, we knew Poppy and Ben would be there too, selling things, as we approached the place we saw lots of different people leaving holding bundles and bags of things they had bought looking very pleased. There were rows of cars and vans spread over a couple of fields. We located Poppy and Ben, and Lilu was in their van; they had been there since 5.30am. We then went off to look at what was being sold elsewhere. We found two good wicker chairs, and bought them for a total of £5.00. Ben and Poppy said they would take them home for us which was a great help. Mas and I wandered up and down until we got really thirsty and sat down and drank a coke each. People began to pack away their goods, and I got talking to a lady about healthy diets. I bought a nice M&S silk shirt from her for 25p, and moving along, I saw a pretty blue sweater being folded and put away. I was offered 4 for £1.00, but just bought the sweater for 25p. We seem to have done well with our purchases, and Ben and Poppy were pleased with how much they had sold as well! I woke up feeling a great lack of energy, and although I had been given tickets to watch a radio play being made at the BBC I thought I had better have a restful day instead. As it happened Glen called round for a few hours,and we had tea and biscuits and chatted in the conservatory. We went to Stanmore for shopping and to go to the bank, this done we had a quiet day. This morning I made some banana bread and an apple crumble, in the dish that Monika had left at our house previously filled with apple crumble for us . We had arranged to go over to Monika and Oktay's house as Jana came to stay with them last night. Monika phoned to say that Oktay would come over to pick us up as they did not trust us, and did not want us to travel to them via Manchester because each time we have visited we have always get lost! Despite protests from us, Oktay came round with Milan to take us over to their house in Cheshunt. I sat in the back with Milan and he chatted busily all the way back to his house. Once indoors there was lots of talking, so much to catch up on, and Monika had prepared a huge and elaborate Turkish meal for us. The children were contentedly playing while we ate and talked, another unforgettable meal. We had a really lovely afternoon with them,but eventually it was time to return home again. Oktay took us back home, leaving Monika to calm down the overtired children, and Jana came with us too. Luckily Salty turned up on cue, and was duly admired by Jana, and we also had some time to catch up on a bit more talk while Mason and Oktay chatted about films and various websites. We eventually waved goodbye to them, and Salty was outside too, so I gathered him up to take him indoors. At that moment Poppy and Ben arrived home, and Poppy told us that Salty had been sitting outside our gate meowing and would not be consoled on the night that we went to the cinema which seems rather sad. It had been a really nice day. 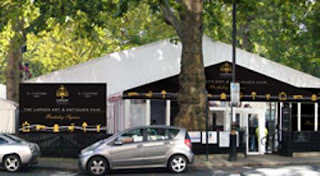 Today I had arranged to meet Pat at Green Park so that we could go to the Lapada Art and Antiques fair in Berkeley Square. They have erected a huge Marquis in the garden for this purpose. 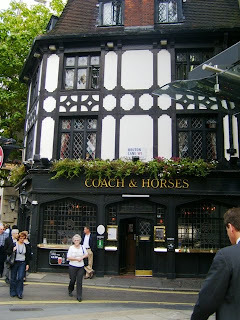 We walked around the neighbourhood for a while, and settled on a pub for lunch. We went upstairs and had waitress service and an unhurried lunch together. Afterwards we walked to Berkley Square, walking along Bruton Street looking at all the ultra expensive shops as we passed by. 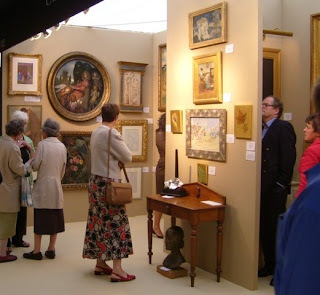 The show was very interesting; Pat was easily able to recognise some of the ornate French furniture, some of it being almost large enough to rent out to lodgers to live in, and much too big for most apartments these days. I admired some of the jewellery, particularly two bugs, one made with garnet and the other with tigers eye , and each finished off well on the underside too with all the legs done individually. We both liked some cat pictures by Louis Wain who spent a long time in Napsbury hospital not far from St. Albans. Once we had seen everything we went off for a final drink at this pub which looked like an old Tudor building, but was actually rebuilt in 1933. We had a long chat in there, and the clientele were very cheerful. It was obviously the place people pop into before taking their train home after work. We decided that we should go out together more frequently from now on. We walked back to Green Park and took trains to the opposite ends of the line. This was a fun day. We got a surprise package of CDs from Chris which I spent some time looking at, while Mas went off to meet up with Robert. It is nice how Chris and Therrie share parts of their life with us; from the computer I had a tour of their new flat in Basle, and the interesting views they have. I also saw how they are progressing with their tango dancing (which is now very impressive); they have been doing this for years. I also had a tour around Basle which is one of my favourite places! I called Margaret who was not feeling very well, and spoke to Alex just as he was rushing off to have his yearly car MOT. In the evening Mas and I went off to Borehamwood and saw the film Julie and Julia. I really enjoyed it, but Mas became a bit restive towards the end, not helped by the fact that his seat was a bit uncomfortable. I can't remember the last time we went to the cinema. it has been a long time. We phoned the vet, and managed to get an appointment at 10.45am for Salty. We put him in his carrying cage and drove off to Borehamwood, and the vet. Poor Salty had been meowing frantically all the way, and was not cheered up by the fact that the waiting room was full of dogs. After a while we saw the vet who cleaned up the abscess, she thought that there was no foreign body stuck in him, but gave some antibiotics to clear it up. Should it reoccur he will have to have it cut out. We drove back home again relieved that he may now be cured, but Salty was panicking again until he exhausted himself. When we got home he rubbed his face on the carpet and slept for hours where he lay. When Salty woke up it was apparent that he felt much better again, and ate huge amounts of food, but first I gave him his antibiotic pill which he thinks is a big treat. Afterwards he went out and was rushing about the garden playing. I had been feeling very tired and my hands and feet had begun to burn at nights again, so I increased the vitamin B6 pills to the amount I had taken previously. Almost immediately I began to feel better. Today I woke up feeling much more energetic and enthusiastic. Mas spent the morning working, and I cut the grass and did more gardening. The bees and wasps are enjoying the ivy which is in flower at the moment. We went swimming, but at a later time than usual so the roads were jammed up with people collecting children from school. Luckily it was not too crowded in the pool. Mas was watching a lady swimmer who was very fast and said sadly that his legs were not worth a toot, so I suggested some Jane Fonda leg exercises in the pool, which we did together, me monitoring him strictly. Afterwards Mas said that nothing worked now! 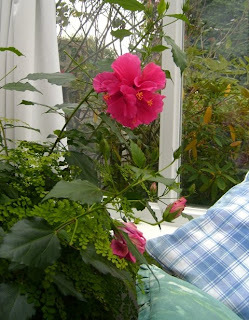 Hibiscus are flowering still in the conservatory. Sick cat and lots of chats. This morning Mas and I were convinced that the abscess was coming back on Salty as he had a small swelling on his side, so we must take him to the vet first thing tomorrow morning. The weather was fine so I did lots of gardening, trimming things back and sweeping up leaves, then went on to clear up the house as well. I called Pat and arranged to meet her next week as I have complimentary tickets for an art and antique fair, and I know Pat loves antiques, and we have not seen each other for a while so there will be much to talk about. Toby phoned and chatted, recommending the film Julie and Julia which he saw with Romy last night, and a new tree has been planted in front of their house, a London Plane tree. Pete also phoned, and said he would stay overnight next Thursday. I watched the first of a new series of Doc Martin in the evening before going off to listen to the radio. Mas and I went shopping, then had lunch at the Man in the Moon. The pub was full of cheerful people, but emptied out as lunch time passed. We had a nice but unremarkable day just gardening, reading and doing things around the house. On Saturday we drove up to St. Albans, got most of our vegetable shopping and met Tania and Robert at the Waterend Barn. We talked for a long time and I found myself very sleepy, no doubt due to the fact that I had woken up at 5.15am. As we were leaving the market, later than usual, the stall holders were packing up. One stall was offering bananas at £1.00 a carrier bag full, so we bought some and when we got home Mas took some of the bananas over to Poppy and Ben. I spent some time blending strawberries and then freezing the surplus. We had a light dinner and watched a video before bedtime. I spoke to Diane today, and then Mas and I went swimming. It is a long time since we last went, luckily the pool was almost empty and as usual both felt refreshed afterwards. 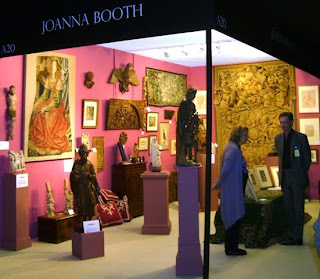 I was going to give Margaret and John some complimentary tickets for the British Art Fair, and saw Poppy and Ben on the way and we talked for a while. John gave me some eating apples that he had picked today, and we chatted briefly. They told me that recently they were going to bed when they heard the lady across the street scream. Apparently, as she was going to bed, she walked into her bathroom only to find a strange man there; he had climbed through the window. He ran away as soon as she screamed, thank goodness. In the evening we watched an episode of New Tricks before bed. We received another driving offence fine, for the second day that we had to take the car to KwikFit for the MOT, and of necessity driving across the bus lane to get into the garage. This is maddening, but if we delay payment both the fines will double to £120.00 each! We went shopping at Stanmore and then had a drink at the Man in the Moon; as I was drinking my refreshing shandy I glanced at their magazine which was advertising the fact that they are now selling three types of ginger beer! After doing the usual chores, I walked down to Starbucks and met Florence for a cake and coffee, a decaffeinated one for Florence as she reacts weirdly to caffeine, and we chatted for a while which was a bit of a strain as some of the other people were talking too loudly. On the way back I dropped a note into the doctors as his prescription cannot be filled as the chemical company no longer supply these medications, and then I got some shopping before returning home. Today Mas met a friend for lunch, so I took down and washed the last set of curtains for this year because they were so dusty. I walked to the bank, and then got my new prescription and got a new library ticket from the library as I could not find my old one, having searched the house several times. I got some books out just as the library was closing and sped off home. Of course I later found my original ticket which is maddening. In the evening we watched the last of The Frankincense Trail with Kate Humble, this has been a truly excellent series. I was rearranging some pebbles, and found I was having trouble focusing on them and thought it is time I had my eyes checked. I soon realised that it was a migraine attack ; I have not had for years. Soon I was unable to see, and Mas made me a cup of tea and I sat down quietly until all the visuals disappeared which only took about half an hour. 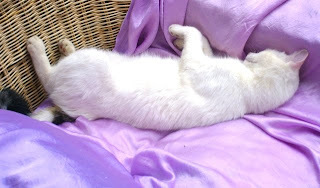 I spent most of the day relaxing, and sat in the conservatory with Salty who was asleep. Later I discovered that the lump on him was an abscess, and I cleaned him up carefully after it had burst. Almost immediately he looked better than he had for a few days, and was bright eyed and wanting to play, and his appetite was back to normal! I finished Peter Ackroyd's The Fall of Troy which was a darkly compelling story, and in the evening we watched the new Agatha Christie's Marple, which is completely dotty, but like a Midsomer Murder has beautiful scenery despite people being killed to the left and right until the killer is almost the only one left standing. Afterwards we watched the stylish French thriller series called Spiral despite it being very violent. I woke with a terribly stiff neck and painful shoulder, which was not helped by receiving a second motoring fine for the second day that Mas had to cross the bus lane, to drive into the garage for the MOT test. Salty also seems to have a lump on his rib cage, and although he does not seem to be in pain we resolved to take him to the vets on Monday. I am worried he may have broken a rib, and Mas feels it might be something worse. Florence phoned to say that although she could use her phone to make calls, the bell on her phone no longer rings. "Must trot off for now - I will be in touch later. I have to get menu choices sorted for a quiz night we are having for Hearing Dogs (I bet you didn't know that dogs did quizzes - marvellous animals!!)" I also heard from Diane and Toby who sounded cheerful. By this time my neck and shoulder were feeling almost completely better. Today Mason went to Edgware to collect his medication, and I went off to Hampstead to meet Diane. Luckily neither of us had to go to the hospital which was nice but unusual. We went to the Flask Pub in Flask Walk and had caught up with each others' news and had a drink. Last year I thirsted for ginger beer, and this summer it seems to be shandy. We had a bit of a walk around, and decided to get a packed lunch deal from Tesco's as an economy measure. Mas and I had just got a fine for driving across the bus lane, which you have to do, to get into the car mechanics, there is no other way to do it, and there is no way of appealing against it and if you do not pay it immediately the fine doubles! That is a fair system! at Carluccios before walking down to Belsize Park and taking the tube home. I walked back feeling tired, and with a stiff neck. As soon as I got home Mas told me that Monika, Oktay and the children were coming over immediately as Oktay was visiting his doctor. Mas had been shopping and had organised a meal for them all. In ten minutes they arrived, and I was amazed to see how much Talu had grown since we saw him last. Our cat Salty ran away from them with a lot of meows and stayed upstairs which surprised me as he is used to the children. Milan and I were talking a made up language together, which was funny, but the difficult part was that I had to tell him what he had said, in English, and what I had replied. Mas had bought some trout for dinner which he had asked the fishmonger to fillet; he had made a poor job of this, so I tried to do it while Milan was singing to me in his made up language and waiting for translations of each verse. We all had dinner together and I got all the news of their recent holiday in Czech. Mas had bought some fancy cream cakes for dessert so we ate these. Monika had made a rhubarb crumble which she gave us (this was much nicer than the cakes which Mas and I found out the following day). Salty began to show himself timidly just before they all went home. It was lovely to see them, but I felt tired as it had been rather a full day. Mas took this picture in the morning, Salty cunningly sleeping on all his dark patches so that they don't show. I spent time today making crab apple jelly. As there has been so little rain, the apples were rather small, but luckily the jelly tasted nice. I also started to make the curtain pelmet in the bedroom which is tedious because there is not a rail for it so I have to bodge something together instead. Today Joan sent advice on getting oil out of cat fur which was kind, and Salty looked much cleaner afterwards; I could not put the cat in water, but I put water and washing up liquid on the cat and rubbed and rinsed. 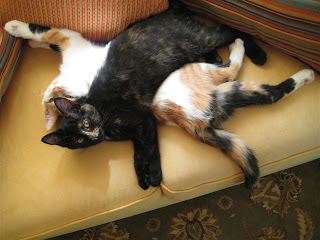 Joan also sent these lovely pictures of kitten sisters. Salty woke me yowling, urgently,downstairs at 2.30am. I ignored it, but Mas got up and put him on the bed to sleep, unfortunately that did not work and he began to make a racket again, so I went downstairs and put out some more kibbles which he snapped into and then went out, and I went back to bed. At 5.30 Salty did a repeat performance so I went downstairs to give him a serious talking to. He was covered in black oil with patches along his back, on the top of his head and on one ear; he has obviously been squeezing himself under clunker cars. I know that ingesting oil is really dangerous, so I grabbed hold of him, pinned him down while I spread butter on his head and back, rubbed it in, and then tried to rub it all off with a soft cloth. Meanwhile Salty was growling badly. I could not get much of the oil off, but his fur was sticking together in yellowish clumps, and also on his head. The patches had spread and he looked rather blotchy with his fur going in different directions; he definitely looked like an evil hyena. Salty left in disgust as soon as he could, and once again I went back to bed. If anyone has advice on how to get oil off fur it would be gratefully received. When we got up Mas was surprised to see how dirty Salty looked, but he was happy to see him whatever he looked like. It was my turn for a check up at the dentists', luckily I did not need to have anything done. The dentist gave me advice about future treatment, and we sadly said goodbye to each other. He told me when Mas comes back for his final treatment he will give him another another Dan Browne book for me. Mas and I will miss him! In the evening we watched the first part of A History of Scotland with the archaeologist Neil Oliver exploring more than 2,000 years of history; the most interesting programme I have seen this year. Afterwards we saw Jamie Oliver's American road trip where he spent time working with genuine cowboys, starting in Wyoming which was very entertaining. Labels: butterfingers, Dan Browne, dentist, engine oil, Neil Oliver. Christiane and Eddie dropped off some complimentary tickets on the way to John and Margaret's; they will be returning to France next week for a month. I did lots of gardening, much to Salty's dismay; I think he fears that I will cut down and pull out all the plants in the garden and not stop till it is bald. Myk called round to give us an update on what is going on locally, and to tell us that there is a meeting in the church hall tomorrow, and chatted for a while. Mas and I went to Edgwarebury Park again, and collected lots of apples and crab apples, so we had a nice apple dessert in the evening. We watched Joanna Lumley in a programme about cats; apparently the Egyptian word for cat is Meow. I watched Lewis too, which I thought interesting, but I think Mas thought they dragged out the story without enough action, and they were talking too much. Today Maheena called in. They have just returned from Kerola, and her daughter has just started her new school. Apparently while they were away, a car, belonging to another neighbour, rolled from the corner where it was parked, across the road, and onto their forecourt hitting Satish's car and then knocking Maheena's car so both cars are damaged! She bought us presents from Kerola that you cannot find here, and some edible treats for Mason. In the evening we dragged ourselves off to do our civic duty. Myk and Jim were there too. I find it all quite fascinating as there is such a mix of strange and interesting characters and it is also quite funny. It really does take a special kind of person like Myk to have the tenacity and determination to try to put things right for the common good. We drove off to St. Albans to meet Tania and Robert for lunch. We met in the market and walked off to the Bua Thai for lunch. We had a nice meal and a lot to talk about. Tania had to work this afternoon, and we had not done our shopping yet. When we left the restaurant, Tania in a hurry, and searching quickly for words, said, before she left she had to go "to the elasticated one." This of course played into Robert's hands, and he said it sounded like a new religion. Repairing to the market sewing stall Robert began to make obeisances to the stall holder, worshipping her. This really shocked Tania who told him to stop it, then Robert told her to come away as it was probably a cult. After this silliness we went to do our shopping, and Tania left for work shaking her head as she went. Salty was still sleeping where we left him this morning. Pete phoned and chatted for a while, but he is still feeling jet lagged and tired. Mas went off to our dentist for another filling, and the dentist mentioned that he would be going to Germany soon, and would leave the practice which is a loss for us. Most of the day spent doing chores, but in the evening watched a film called Julia with Jane Fonda and Vanessa Redgrave in it, for which she won an Oscar. It was set in the time period just before the second world war. It was very good, but had a really sad ending. Today, once again, Mas took the car off to the garage, and after hanging around most of the day it eventually passed the MOT so we can drive it for another year.. I went off for a walk while he was out, and later managed to catch up on a few emails. I walked off to Mill Hill again leaving the washing machine slaving at home. The weather turned hot and sunny, as I walked home Poppy passed in her car hooting, and later Wynford went past me waving as well. Mas in the meantime booked our car in for the yearly MOT for tomorrow. I swept up lots of leaves from the garden, making Salty very excitable, and pottered around tidying and trimming. Mas spent all day working on his computer. We watched the first of a bleak new crime drama series called The Fixer, about a kind of vigilante police group. Afterwards we saw a programme about Jamie Oliver doing cookery things in Los Angeles, he is doing a road trip series. I was surprised as I really enjoyed it as it was really upbeat, and hope to watch more of them. The cat slept on the bed again tonight; I think I have got large bags under my eyes now! Today Mas took the car into the garage, and shortly afterwards met a friend for lunch. It was raining on and off all day. I froze away some stewed apples for another day and pottered around the house. I had a nice long email from Jana which cheered me up, and Diane phoned too. Later Mas went off to the garage as we had not heard from them, and found we needed to have the brakes adjusted as the car was pulling to one side; I thought I had heard them squeaking sometimes recently. We also found out that we have to have new headlights put in because when the car skidded into ours when it was snowy it had cracked the front and the lights are not supported properly. Mas will take the car back on Friday to get this done, and hopefully get the MOT certificate for the next year. When we went to bed the cat was sleeping in the middle of the bed and would not wake up, so I had to gently drag him by the head and shoulders over to the side of the bed. I am being very careful of him as he seems to have hurt his ribs, and growls if Mas or I stroke his side. I am hoping he is just bruised; he is breathing normally. It appears that the Tabby cat is not coming through the cat door into our house at night now which is more restful.